A letter or group of letters added to the beginning or end of a word to get a new word with a changed meaning. A letter or group of letters added to the beginning of a word to get a new word with a changed meaning. A letter or group of letters added to the end of a word to get a new word with a changed meaning. General meaning: a level of skill, intelligence, etc. 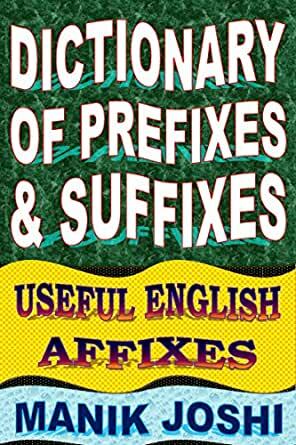 I do not have time to make my own book for class, and I don't have to because this book gives my students all the affixes they need to know. This book is very important to my middle school curriculum, and in the end-of-the-year survey, students mentioned this book and the one on roots as being the best reference book in the classroom. This dictionary is not what I expected. I was looking for a "Websters" like dictionary that I could look up prefixes and suffixes just like a regular dictionary. This will do but its not as extensive as I needed. 3.0 out of 5 starsSave Your Money!! Well...it's a self-published book that lacks for sure! VERY IMPORTANT TO UNDERSTAND PREFIXES AND SUFFIXES SO AS TO KNOW HOW A WORD IS BEING USED.